Genuine tanzanite gemstone set in a sterling silver vintage ring with white topaz gemstone heart accents. 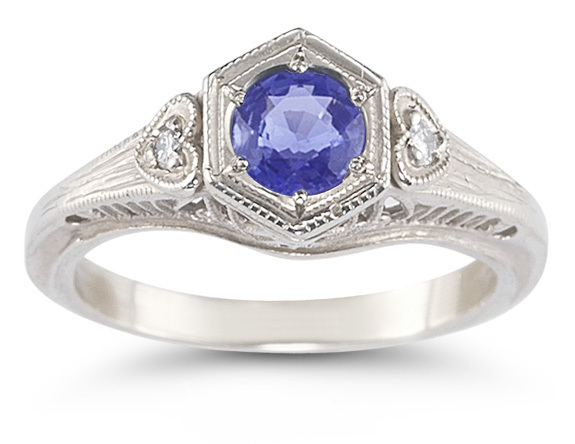 An eye-catching 5mm round tanzanite serves as the centerpiece of this ring, a piece with time-tested style. This brilliant blue stone has a hue unlike that of any other gem and its unique bluish-violet color allows it to bring a fresh sense of life to a vintage-inspired design. Two 2mm round white topaz stones serve as accents, as one sits on each side of the center gem inside of a carved heart. The .925 sterling silver that holds these stones provides beauty and affordability. We guarantee our Tanzanite Heart Ring in Sterling Silver to be high quality, authentic jewelry, as described above.